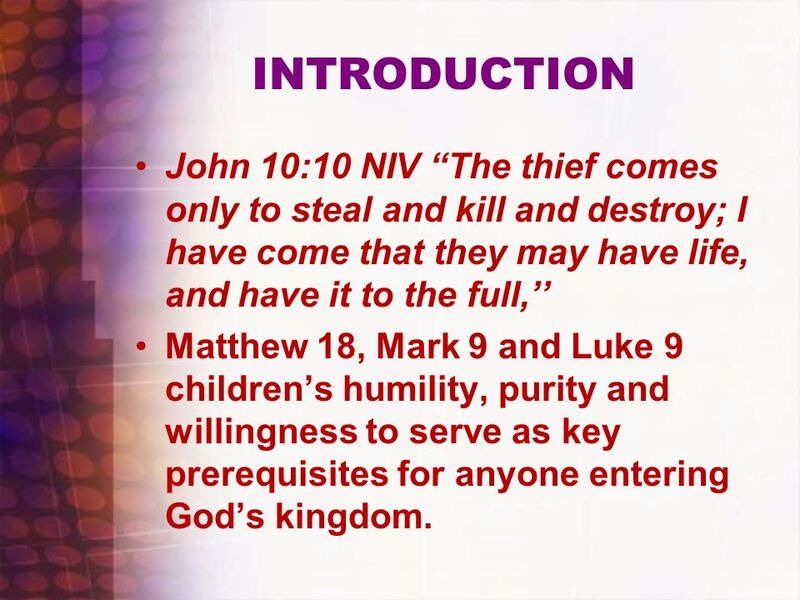 2 INTRODUCTION John 10:10 NIV “The thief comes only to steal and kill and destroy; I have come that they may have life, and have it to the full,’’ Matthew 18, Mark 9 and Luke 9 children’s humility, purity and willingness to serve as key prerequisites for anyone entering God’s kingdom. 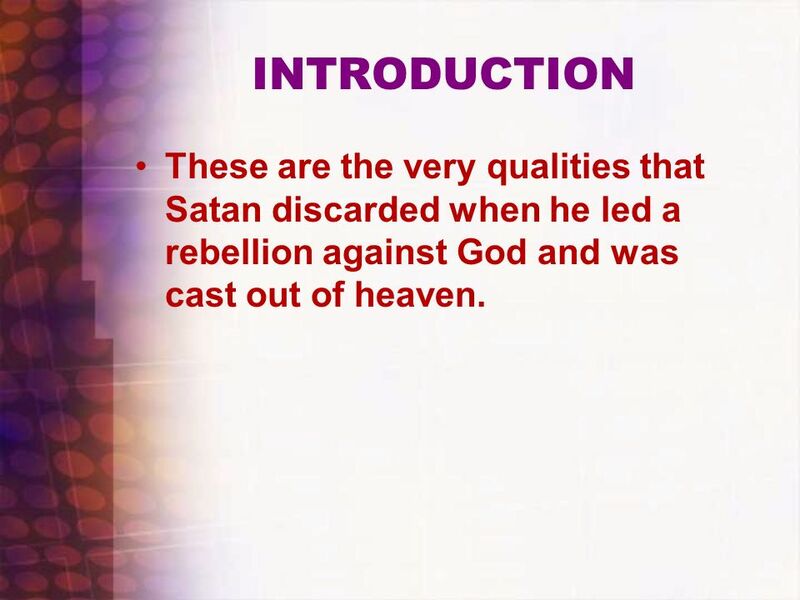 3 INTRODUCTION These are the very qualities that Satan discarded when he led a rebellion against God and was cast out of heaven. 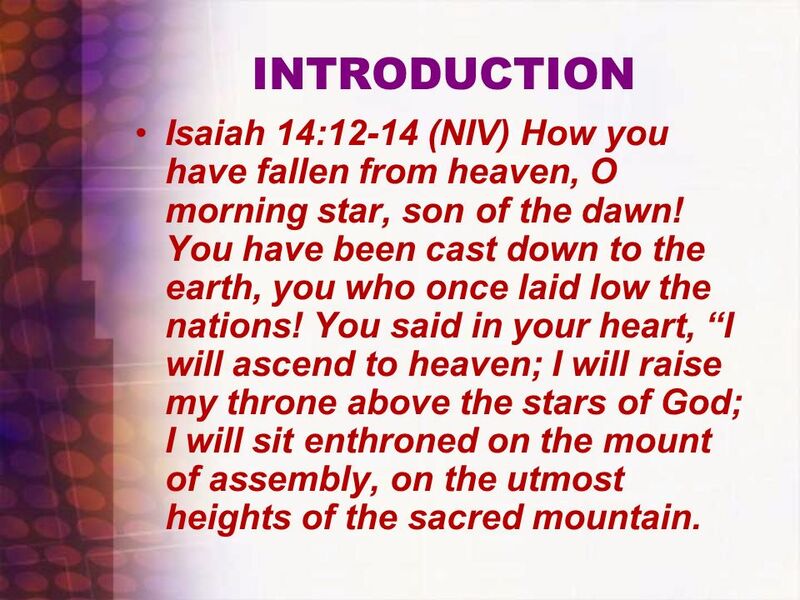 4 INTRODUCTION Isaiah 14:12-14 (NIV) How you have fallen from heaven, O morning star, son of the dawn! You have been cast down to the earth, you who once laid low the nations! You said in your heart, “I will ascend to heaven; I will raise my throne above the stars of God; I will sit enthroned on the mount of assembly, on the utmost heights of the sacred mountain. 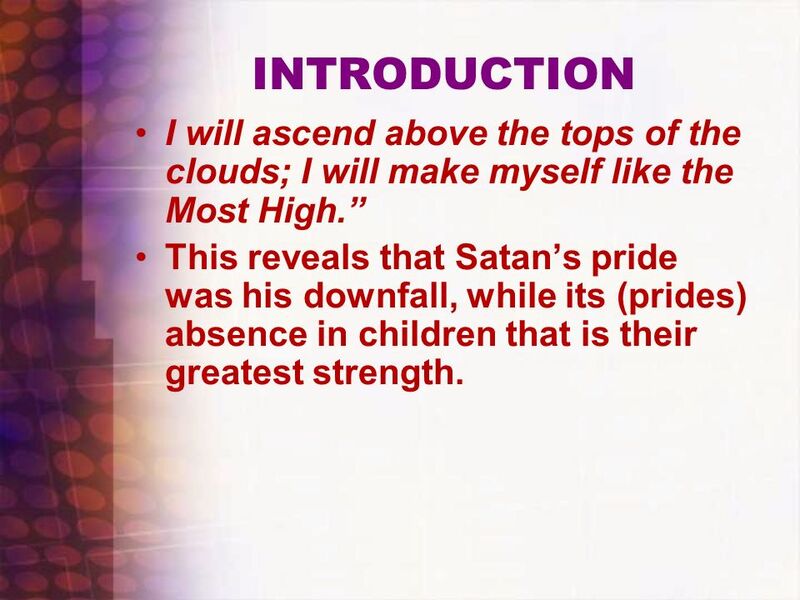 5 INTRODUCTION I will ascend above the tops of the clouds; I will make myself like the Most High.” This reveals that Satan’s pride was his downfall, while its (prides) absence in children that is their greatest strength. 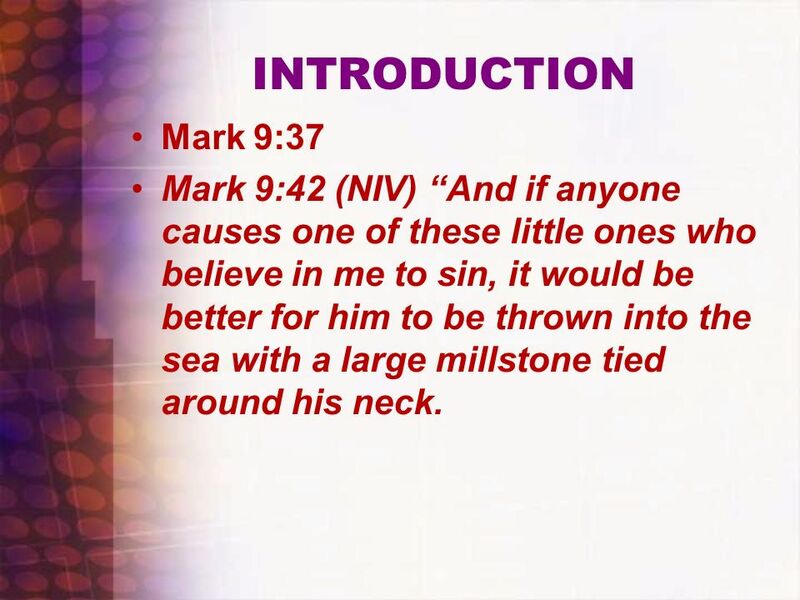 6 INTRODUCTION Mark 9:37 Mark 9:42 (NIV) “And if anyone causes one of these little ones who believe in me to sin, it would be better for him to be thrown into the sea with a large millstone tied around his neck. 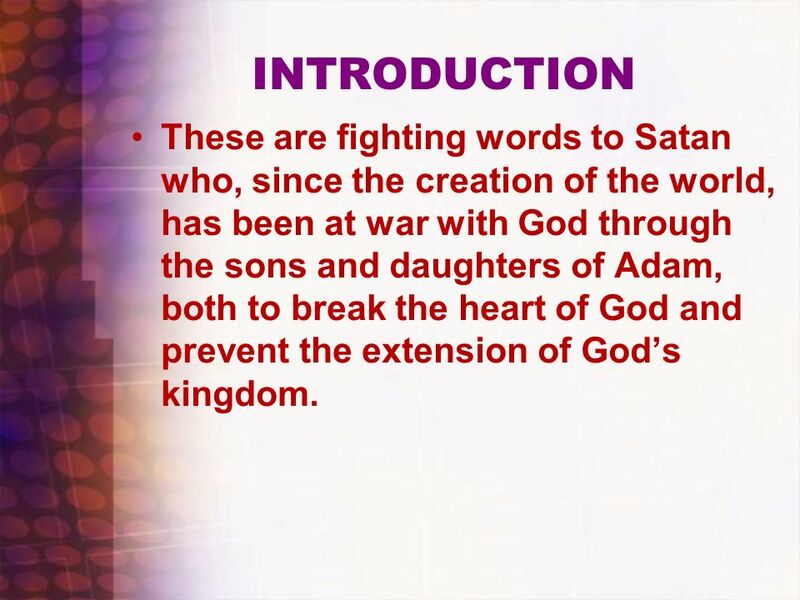 7 INTRODUCTION These are fighting words to Satan who, since the creation of the world, has been at war with God through the sons and daughters of Adam, both to break the heart of God and prevent the extension of God’s kingdom. 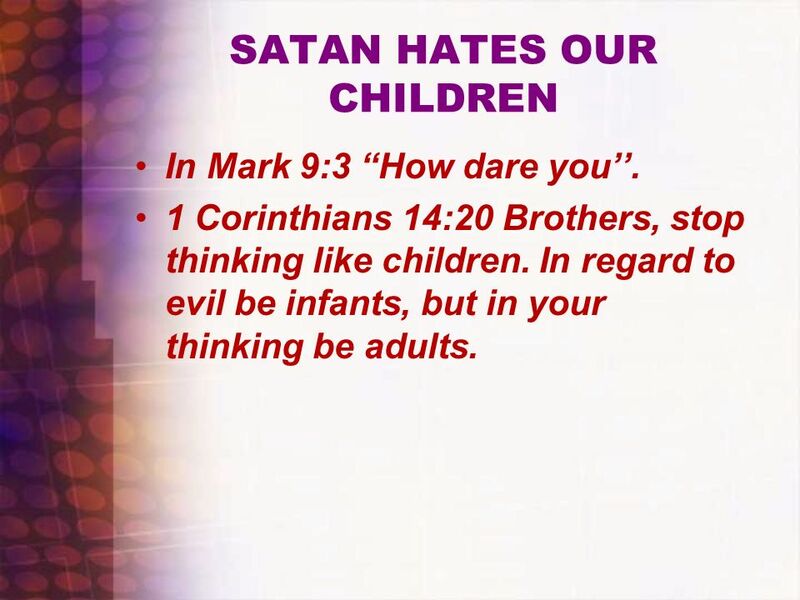 SATAN HATES OUR CHILDREN BECAUSE THEY ENJOY AN INTIMACY WITH GOD THAT SATAN LOST Matthew 18:10 (NIV) “See that you do not look down on one of these little ones. 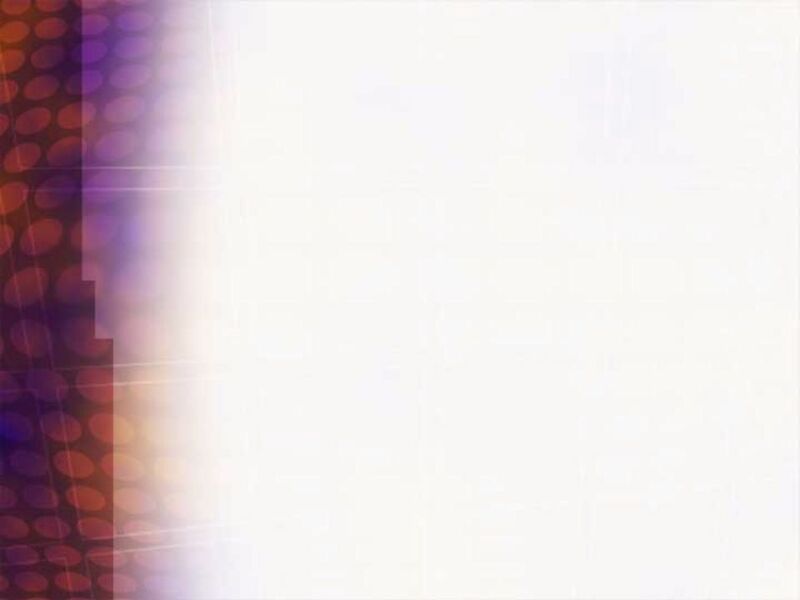 For I tell you that their angels in heaven always see the face of my Father in heaven. …“Let the little children come to me, and do not hinder them, for the kingdom of God belongs to such as these. I tell you the truth; anyone who will not receive the kingdom of God like a little child will never enter it.” And he took the children in his arms, put his hands on them and blessed them. 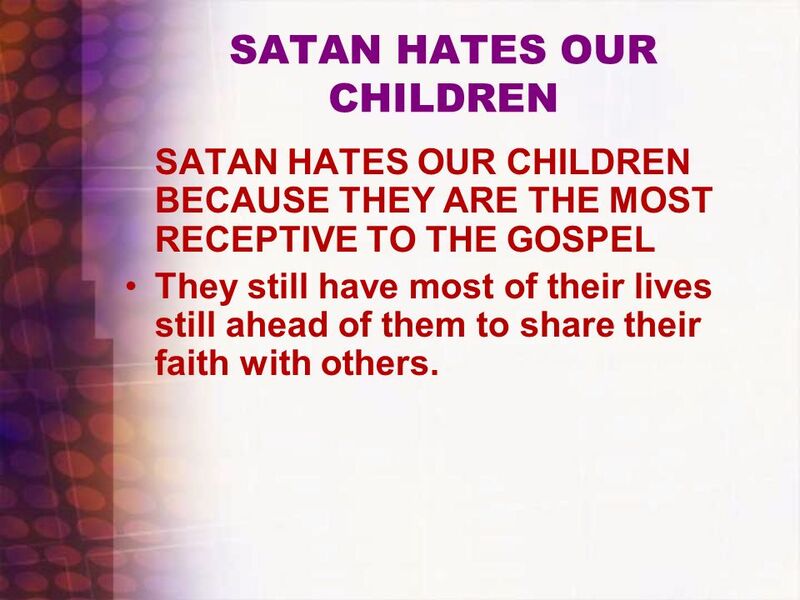 SATAN HATES OUR CHILDREN BECAUSE THEY ARE THE MOST RECEPTIVE TO THE GOSPEL They still have most of their lives still ahead of them to share their faith with others. 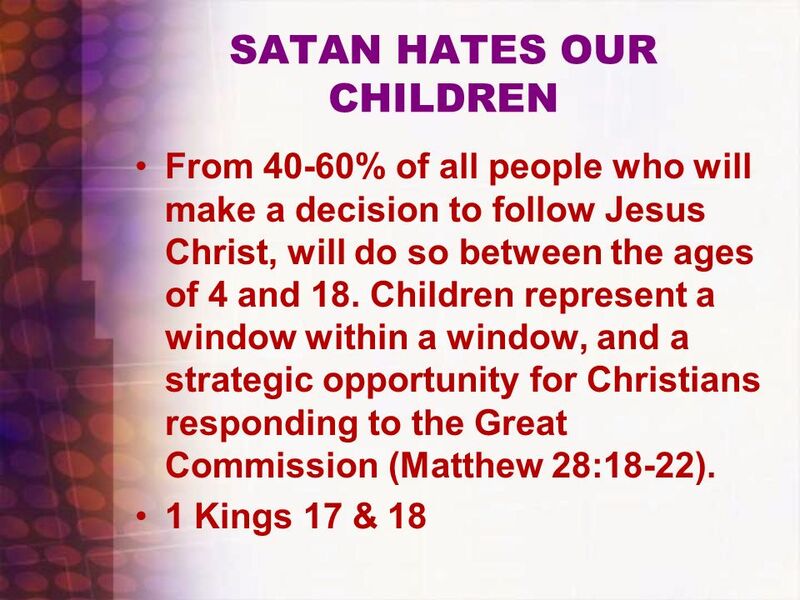 SATAN HATES OUR CHILDREN BECAUSE THEY ARE THE MOST RECEPTIVE TO THE GOSPEL There are 4 billion people living within the 10/40 window including 37 Muslim countries and 7 Buddhist nations. 80% of the world’s poorest people live there. 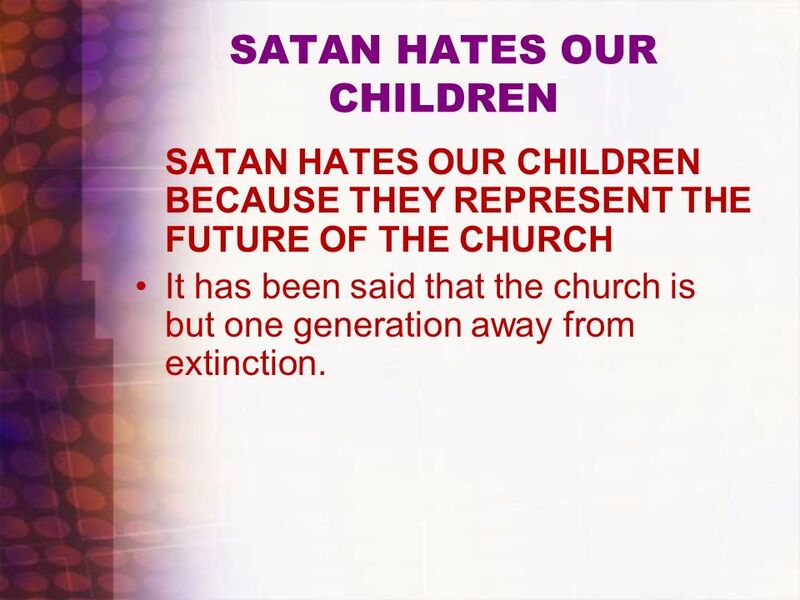 SATAN HATES OUR CHILDREN BECAUSE THEY REPRESENT THE FUTURE OF THE CHURCH It has been said that the church is but one generation away from extinction. 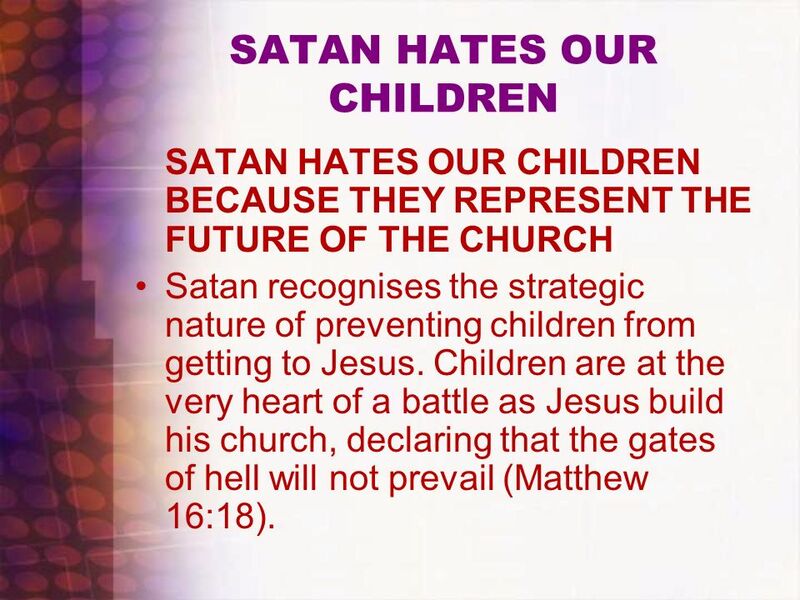 SATAN HATES OUR CHILDREN BECAUSE THEY REPRESENT THE FUTURE OF THE CHURCH Satan recognises the strategic nature of preventing children from getting to Jesus. Children are at the very heart of a battle as Jesus build his church, declaring that the gates of hell will not prevail (Matthew 16:18). SATAN HATES OUR CHILDREN BECAUSE THEY HAVE A SIMPLE FAITH, INNOCENCE AND READY ABILITY TO BELIEVE THE THINGS OF GOD Jesus told his disciples in Mark 10:15 that they would not enter the Kingdom of God unless they became like little children. In John 3:3, Jesus said we must be born again. In Mark 9:3 “How dare you’’. 1 Corinthians 14:20 Brothers, stop thinking like children. In regard to evil be infants, but in your thinking be adults. their ability accept things at face value their gift of perception that enables them to discern duplicity and hypocrisy their sense of awe and wonder at God’s creation Their willingness to share and give to others their simple needs, optimism and faith. Dr Vinay Samuel says children have an inherent transcendence, a sense or sensitivity to the Divine, to “mystery’’ and to the touch of God in their lives. 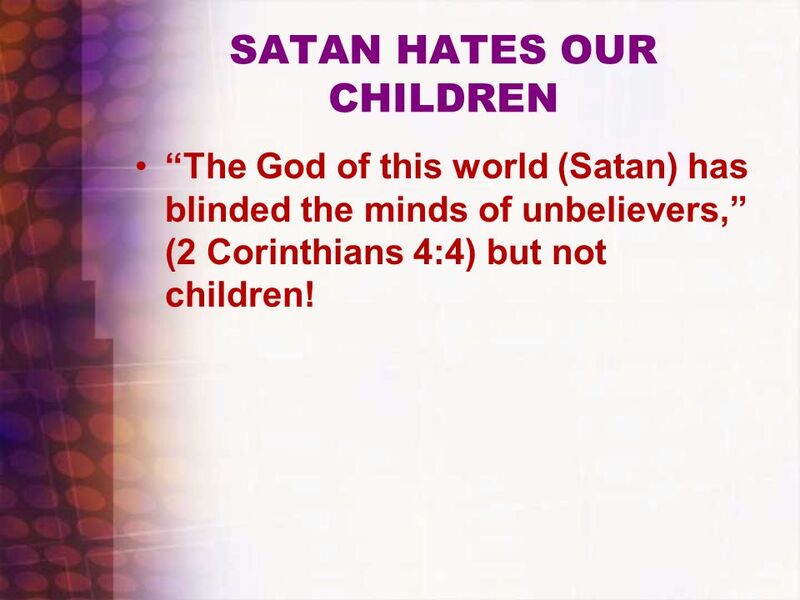 SATAN HATES OUR CHILDREN BECAUSE THEY LOVE GOD, AND HE LOVES THEM Jesus and children Jesus could trust himself to children in a way that he could not and would not with adults Children never turned on him the way adults did! 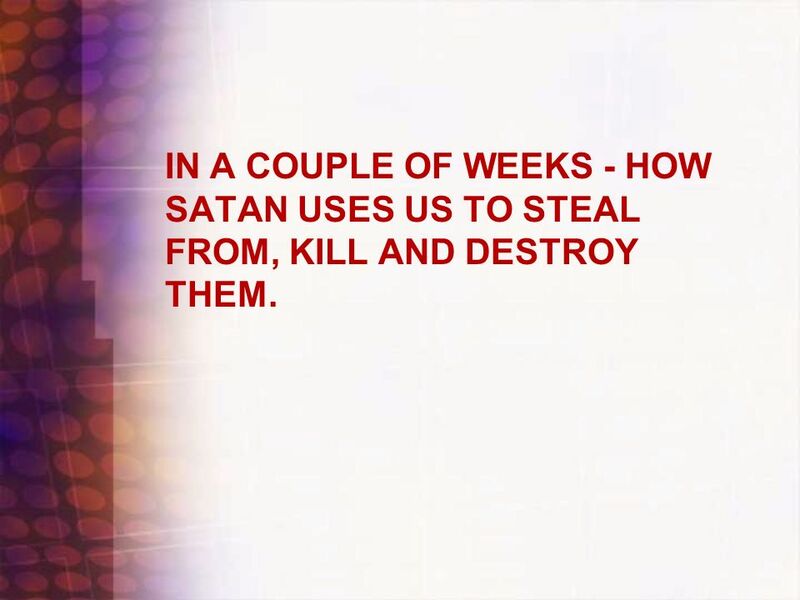 27 IN A COUPLE OF WEEKS - HOW SATAN USES US TO STEAL FROM, KILL AND DESTROY THEM. 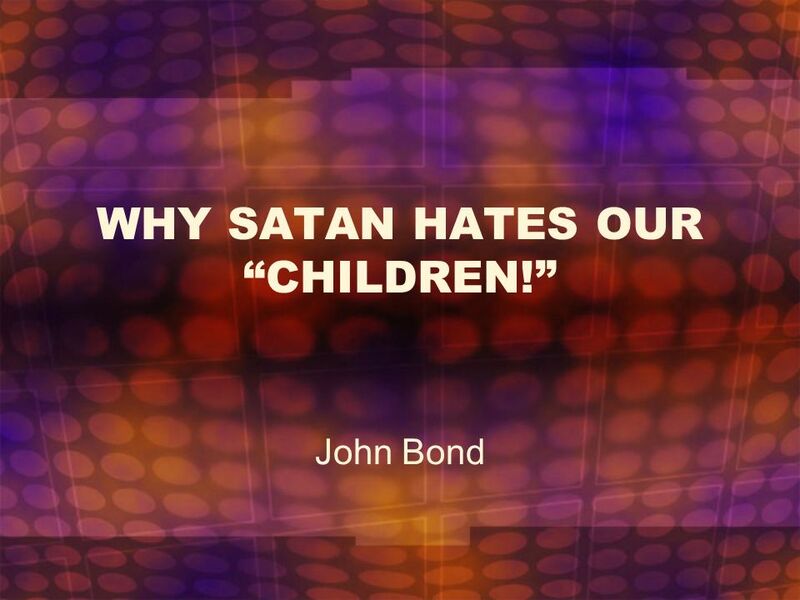 Download ppt "WHY SATAN HATES OUR “CHILDREN!”"
Lesson 34: Jesus Exaltation in Heaven. Some rulers use their power for their own selfish ends. For example, he may overtax people and keep much for himself. All we need is Love. All we need is Love Introduction the Book of Love “Love” used 676 time in NASB 360 times in the New Testament Where do we go? Jesus the God-Man Why is it important that Jesus is both God and man in one person? Old Adam vs. New Man Catechism Lesson #36.